Forbes, an organization with a website presumably built on the value of its content, also has made the unfortunate decision recently to try to block off access to anyone using adblocker software, apparently so that it could successfully allow malicious "ads" to infect its readers' machines. This set of circumstances would seem to be one that would have Forbes re-thinking its adblocker policy, assuming it wishes to retain the trust of its readership. And it turns out that Forbes is doing so. And then not! Or maybe? Allow me to explain. Forbes, a site that in the past has allowed malicious ads to be presented to its readers, would now like access and control of those readers' social media contacts, which sounds like a terrible idea. But even more strange was when Leathern bothered to look into the terms of services that such a membership with Forbes entailed. So I’ve basically agreed now to not block their ads, after signing up for the express purpose of being able to see their content while blocking their ads. I wish I could strike all Forbes links from my Google News aggregator. They take up space that could be served by other sites. As it is now, I just avoid any links going to Forbes because I am NOT going to turn off my adblocker. There are a ton of sites that I wish I could tell Google News to omit. That I can't do that seriously diminishes its value. Ed, this is possible by going to news.google and clicking the "Personalize" button at the top-right. Add Forbes in the "Adjust Sources" section and move their slider all the way to the left. I have a large handful of walled gardens and clickbaiters in there. Ah, thanks! I never knew this was possible. Ack. Well, it's close, but not quite close enough. Those settings only apply to the google news "front page". Could this be Forbes trying to turn the Feds loose on viewers with ad-blockers? If you agree to not use an ad-blocker in return for access, and then use an ad-blocker, they could claim that your access was then "unauthorized", and a felony violation of the Feds' favorite computer law, the Computer Fraud and Abuse Act (CFAA). That'll teach those nasty ad-blockers! Don't blame Forbes for what Forbes is doing. They're two separate companies. Have a talk with your sales department and the production department. Most companies are composed of few to a few dozens of companies inside that don't talk to each other and often get into fights. That's the way my body is. Parts of it may do things that other parts may not agree with. Still, the whole thing gets held responsible. It's just not fair! ...from every other spammer, phisher, e-pender, and stalker. So in addition to being schizophrenic about adblocking, Forbes is also apparently under the delusion that adblockers are a third party. My adblocking plugins aren't a "third party". They're me using a tool to remove, obstruct, and otherwise interfere with content that is both suspect and undesirable. The lists of rules they use are fully under my control, and the updates to these lists merely automate a process I would otherwise be doing myself. So when the adblocking plugins in my browser block something that's not some third party blocking something, that's me blocking something. The little guy sitting by my keyboard wants me to point out that schizophrenia is NOT about having multiple personalities. You're confusing it with Dissociative Identity Disorder. Hey always asks me to type these things since his hands are too small. well can we have Forbes committed now? If corporations are people now, and Forbes is a corporate person, then they should have corporate mental health issues too, right? So the evil Forbes want to infect you with malware while the good Forbes want you to be free (bonus Queen soundtrack in the background). This needs to be turned into a movie starring Jim Carey. Oh wait. We set the rules and you agree we set the rules simply by reading this sentence. Gotcha! But it's an "ad-light" experience! What gets me is that the page they throw up if they detect an ad blocker says to turn it off "to continue into Forbes' ad-light experience." When I use adblock, it tells me how many things it blocked, and just to show that page, the number is in the double digits. That is too much effort to go through just to view a page occasionally. As long as they have a problem with ad blockers I don't need to show up there at all. The ad blocker stays on as long as the ad pest industry ignores cleaning up it's act. I'm pretty sure that 99% of people are just going to close the tab, rather than jump through their hoops. 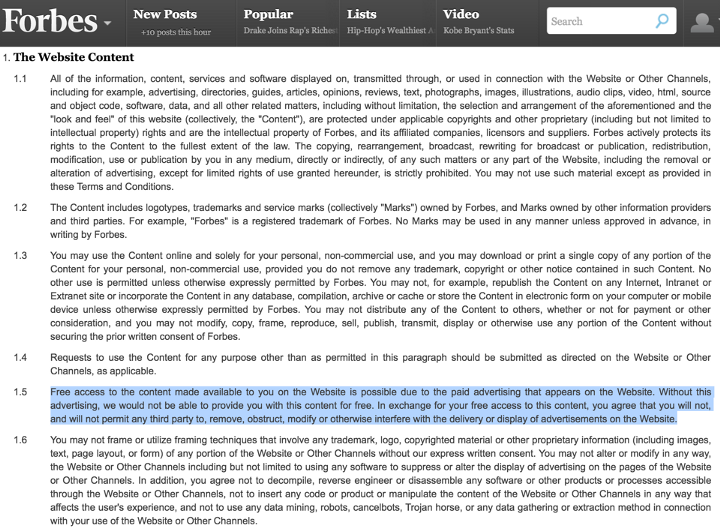 Forbes is getting wise to a new method of ad blocking, at the sever level. I block ads at the router level, and that used to work with Forbes, but not anymore. companies can go bankrupt first .. i really don't care. There is no article out there that is worth reading if it's not somewhere else i can get to it without compromising my security and/or contact list. I love this sentence and I think it needs to be said more often simply because the argument over using adblockers is usually worded as "you're stealing content by blocking ads". Yet not many people talk about the malware that gets served as ads. Saying you're stealing content is completely backwards! If I don't read every single letter of the page, am I stealing content as well? I guess not going to their website is also stealing content, then, right? I probably owe them a fortune, because I can't remember the last time I opened one of their pages. "Saying you're stealing content is completely backwards! If I don't read every single letter of the page, am I stealing content as well?" Not just read it, but buy the products as well. If you don't buy the products, then you're stealing! But let's be reasonable. You don't have to buy every product. One buy per page should do it. I right click on the interstitial and select Block Element from the menu. Forbes has become a content farm filled with clickbait anyway. You're better off not reading anything their "contributors" post. I will treat them like I treat wired, never click links to their site again. Want my eyes to see your adds? Serve them without requiring scripting. Want to assume that all people using script blockers are doing so to block adds? Enjoy digging your hole deeper and deeper. What the hell is Forbes even thinking with this?? Apparently, they're perfectly fine with people who block ads as long as they are willing to go along with something much, much worse. They have access to your Social communications? So, you wonder their site and ALL your nets, send links to the Forbes site, SHOWING what you are reading..
who HERE would allow FIRST PARTY ADVERTS?? not adverts from a 3rd party, Only ones from the site you are on?? Raise your hand...I know you are there..
Why cant Forbes GET IT into their heads, that THEY can make the ADVERTS for their site, for OTHER advertisers..and GET PAID FOR IT..
Because demanding better ads is to hard compared to looking for new ways to screw over readers. It's unfortunate that if you ARE on someone's contacts list and they accept such an agreement the company in question already has access to your information whether you want them to or not. Most people still "click through" permissions and licensing systems like this without even bothering to read the fine print. Unless Google fine grains Android permissions even further and make *everything* including their own apps opt-in (and it will take laws to do it because they won't on their own) this isn't going to change. It's yet another in the long list of reasons to stop using Facebook.